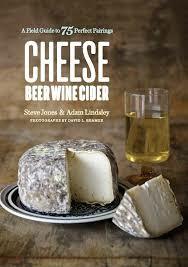 Cheese monger Steve Jones’ years-in-the-making collaboration with writer Adam Lindsley is finally here! CHEESE BEER WINE CIDER: A FIELD GUIDE TO 75 PERFECT PAIRINGS offers a crash course in buying, storing, and serving cheese & alcohol and delivers a treasure trove of delicious and often surprising pairings that take the cheese and beverage to the stratosphere of flavor. Steve is a longtime regular here at Belmont Station, so, of course, we wanted to host a book release party! Come meet the authors, then try three special pairings specially selected by Steve for this event!